Merry Christmas – open thread | Watts Up With That? As of this post, I’m offline until late Monday PST. Moderators, don’t be shy about taking time off too. To all, no matter which side of the debate you are on, no matter whether you love me or hate me for what WUWT does, I wish you a Merry Christmas. I leave you with a selection of my favorite Christmas music. ← Mann hockey stick co-author Bradley: "it may be that Mann et al simply don't have the long-term trend right"
Happy Xmas Anthony (and Moderators)! Not Christmassy but timely, and funny. Anthony, moderators, contributors and to all my fellow readers, have a joyous and wonderful Christmas. Merry Christmas, Happy Hanukkah, and a Joyous New Year to you and your friends and families. Many thanks to all for your wisdom and knowledge willingly shared. We just drove 5 hrs did some more last min shopping and stopping by here to wish all a very Merry Christmas and Happy Hanukkah. Tom you beat me to it, but I will repeat it:Mele Kalikimaka! Peace and goodwill to all and many thanks for all the hard work, and humour, from Anthony and the Mods and the variety of posters which makes this site such a good read. Re Churchill: “Some chicken, some neck”. Have a wonderful – and restful – Christmas and a very Happy New Year! Seems Christmas comes earlier every year and the tidings are warmer. Hmmmm… Could we fit that to a graph? Joys of the season. Just to wish each and everyone a very Merry Christmas and a Prosperous New Year. Thank you so much for your dedication and hard work. Your mission is honorable and most important. All the very best in 2012. Merry Christmas from New Mexico where we are having a very white Christmas. It’s beautiful. And to Anthony: Thanks for another brilliant year of WUWT. Enjoy your well-earned holiday! Hristos se Rodi! Voistinu se Rodi! Please accept with no obligation, implied or implicit, my best wishes for an environmentally conscious, socially responsible, low stress, non-addictive, gender neutral celebration of the winter solstice holiday, practiced within the most enjoyable traditions of the religious persuasion of your choice, or secular practices of your choice, with respect for the religious/secular persuasions and/or traditions of others, or their choice not to practice religious or secular traditions at all…and a fiscally successful, personally fulfilling, and medically uncomplicated recognition of the onset of the generally accepted calendar year 2012, but not without due respect for the calendars of choice of other cultures whose contributions to society have helped make this country great (not to imply that this country is necessarily greater than any other country), and without regard to the race, creed, colour, age, physical ability, religious faith, or sexual orientation of the wisher. Note: By accepting this greeting, you are accepting these terms. This greeting is subject to clarification or withdrawal, and is revocable at the sole discretion of the wisher at any time, for any reason or for no reason at all. This greeting is freely transferable with no alteration to the original greeting. This greeting implies no promise by the wisher to or responsibility for the consequences which may arise from the implementation or non-implementation of same. Happy Christmas to all. A happy, healthy and prosperous new year 2012 also, and may the truth be with us all. v novem letu pa veliko zradvja in sreče. I hope that you, Anthony, the moderators, and everyone who reads here have a Happy Christmas Season and a Fulfilling and Successful New Year. Merry Christmas to everyone – nearly 100 million of us now. Merry Christmas everyone, from the beautiful and warm south coast of NSW. It’s been a marvelous year of WUWT discovery, revelations, insight, funnies, and revealed truth — immersed in the continuous tide of truth-evasion by The Team, the Establishment Media, and the usual assortment of parroting fact-free blog-heads. 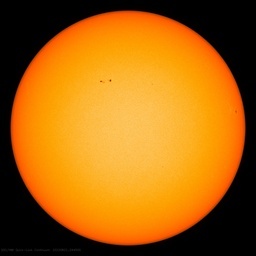 Weather will continue to illuminate the truth of “climate” and the general irrelevance of mankind to long-term trends. Poley bears will thrive. Life goes on. Our lives will continue to be enriched by fossil-fueled power. And plants will love us for our minor additions to their atmospheric fertilizer. If any Warm-istas want to sell their “endangered” beachfront property at deep discount, I’m more than willing to engage. This is in the Science section, not opinion. Merry Christmas to all of you , even our trolls . How “Merry Christmas” is said …..
Merry Christmas to all. May you all be blessed this day, month and year. I’m very impressed with our multilingual mods. Merry Christmas guys and/or gals and thanks for all you do! I’ve cracked one of the encrypted emails – quite revealing!!! I’m happy to inform you that the company Christmas Party will take place on December 21st, starting at noon in the private function room at the Grill House. There will be a cash bar and plenty of drinks! We’ll have a small band playing traditional carols…please feel free to sing along. And don’t be surprised if the MD shows up dressed as Santa Claus! 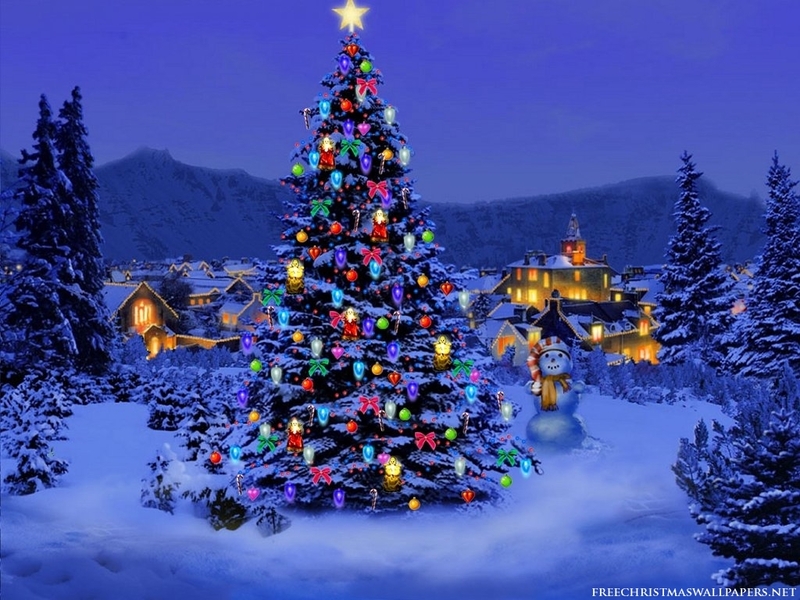 A Christmas tree will be lit at 1.00p.m. Exchange of gifts among employees can be done at that time; however, no gift should be over $20.00 to make the giving of gifts easy for everyone’s pockets. This gathering is only for employees! The MD will make a special announcement at the Party. We recognize that Chanukah is an important holiday, which often coincides with Christmas, though unfortunately not this year. However, from now on we’re calling it our ‘Holiday Party’. The same policy applies to any other employees who are not Christians. There will be no Christmas tree or Christmas carols sung. We will have other types of music for your enjoyment. Regarding the note I received from a member of Alcoholics Anonymous requesting a non-drinking table…you didn’t sign your name. I’m happy to accommodate this request, but if I put a sign on a table that reads, ‘AA Only’, you wouldn’t be anonymous anymore!!!! How am I supposed to handle this? Somebody? Forget about the gift exchange, no gift exchange allowed now since the Union Officials feel that $20.00 is too much money and Management believe $20.00 is a little cheap. NO GIFT EXCHANGE WILL BE ALLOWED. beliefs, perhaps the Grill House can hold off on serving your meal until the end of the party – or else package everything up for you to take home in a little foil doggy bag. Will that work? Meanwhile, I’ve arranged for members of Weight Watchers to sit farthest from the dessert buffet and pregnant women will get the table closest to the toilets, Gays are allowed to sit with each other, L*sbians do not have to sit with gay men, each will have their own table. Yes, there will be flower arrangements for the gay men’s table too. To the person asking permission to cross dress – no cross dressing allowed. We will have booster seats for short people. Low fat food will be available for those on a diet. We cannot control the salt used in the food we suggest those people with high blood pressure taste the food first. There will be fresh fruits as dessert for Diabetics; the restaurant cannot supply ‘No Sugar’ desserts. Sorry! Did I miss anything?!?! RE: The F….. Holiday Party. Vegetarians… I’ve had it with you people !!! We’re going to keep this party at the Grill House whether you like it or not, so you can sit quietly at the table furthest from the ‘grill of death’, as you so quaintly put it, you’ll get your f,,,,,, salad bar, including organic tomatoes, But you know tomatoes have feelings too, They scream when you slice them. I’ve heard them scream. I’m hearing the scream right NOW !! I hope you all have a rotten holiday, drink drive and die. I’m sure I speak for all of us in wishing Pauline a speedy recovery, and I’ll continue to forward your cards to her. In the meantime, the Management has decided to cancel our Holiday Party and instead, give everyone the afternoon of the 23rd December off with full pay. Merry Christmas and a good New Year to you and all of your family, Anthony, from all of Australia. Merry Xmas, I read the blog most days and it cheers me greatly that I’m not alone in thinking the world’s gone mad……..
Here’s a silly video I shot at a family party, time for the lighter side of life. a very merry xmas and happy new year to anthony and family, the mods, and all who visit and/or contribute to WUWT. Christmas greeting from Western Australia, where Christmas weather is the same every year, horizon to horizon blue skies and hot sun. Now, give your significant other a really big hug … or two. Great cure for stress. Merry Christmas to all from Sydney! May sanity and common sense prevail in the New Year! Wonderful musical choices. Nat King Cole is incomparable and I couldn’t stop going from one Dean Martin number to another. Just his voice is enough to sooth the inner beast. It is my favorite thing on the net! No end of brain candy in the articles and comments. So all the best to everyone involved in this ongoing gift – contributors and commenters and moderators – and my sincere thanks to Anthony for wondering about the impact of latex paint on the global climate and all the wonderful things he has done since. And now you are an IPCC reviewer!!! Long way from how it all started. To stick to something I can prove… A Splendid Solstice Season to the whole world. No exceptions! Merry Christmas to all you guys and gals………………..
Merry Christmas to you and yours AW & Mods! Have a very, very good one. And you guys are instrumental in bringing about the changes, many, many thanks. Merry Christmas from Canberra, Australia. It’s a beautiful sunny day here, the bubbly and prawns are chilling in the fridge, and the barbie will shortly be fired up. Very special Season’s Greetings to FOIA, whoever and wherever they are. You have done the planet a great service, possibly the greatest of 2011. Happy Christmas friends one and all. Merry Christmas and Happy Hanakkuh to all! Thank you, Anthony (and mods), for all you do. WUWT is a bastion of sanity is a sea to idiocy – and we appreciate it. Happy Christmas from Chris Huhne, soon to be ex climate change minister…. Merry Christmas or Happy Hanuka to all of the WUWT denizens. Merry Christmas Anthony. May you and yours be blessed this season and in the coming year. The Schwartz! Use the Schwartz, Lonestar! The ring was bupkis! Have a peace filled day and a hope filled new year. I raise my pint to all.here. Merry Christmas to all that make this the best site on the Internet – contributors, mods, commenters and even lurkers. May you be blessed with every good fortune in the coming year from Colorado Springs, where we’re both tracking Santa (NORAD) and enjoying a white Christmas. My crystal ball forebodes the number of views shall reach 100 million on 14 January. Anthony: Our best wishes for you and your family. Merry Christmas! The consensus supports wishing a Merry Christmas to all 100 million of us! May all of you enjoy a happy (insert reference of your choice). I would like to take this opportunity to claim the title of WUWT Grinch. I am both a workaholic and an addicted…uhm…Wattsupwiththatian. Even a brief respite from both results in withdrawl symptoms for me! “the Team”. Never have so few done so much with so little. You are both an inspiration and a dire warning of what happens when we are not vigilant in the defense of the truth. “the mods”. Wow, how you guys keep up and keep the discussion civil without strangling the debate is beyond me. thankyou thankyou thankyou. “those who made me laugh”. Serious as the matters we discuss are, the humour on this site keeps me coming back as much as the science. “those whom I made laugh”. There is no greater satisfaction for a humourist than to know that his work has brought merriment to others. I hesitate to clutter up threads with thankyou notes when people compliment my writing, so wanted to take this opportunity to thank all of you who did. “the authors”. I’ve learned SO much on this site, from SO many articles, and I know the amount of work it takes to write a good one, and that even a great article comes under fire, some justified and some not. Please keep the great work coming, and the same to those who jump into threads to share their knowledge, their experience, and their criticism. There is a PhD worth of knowledge to be had every week at WUWT thanks to your efforts. “Anthony”. I cannot thank you enough for what you have accomplished with WUWT, both as a forum that I personally enjoy participating in, and as a forum that is a major part of pulling the human race back from a descent into insanity. Thank you Anthony and mods for another year of erudition and entertainment – your site is a tonic. Happy Christmas from a rather warm UK. Merry Christmas to Anthony, the Mods, Guest Posters, commenters but especially to all EVUETIPTCTHODTEOAPTs and ETILTDSAWAWTMEITUs that might be listening. I liked it. Sounded like Yoda. Merry Christmas to all from Colorado Springs, CO. We have plenty of snow on the ground and on the side streets. It’s only gotten to the upper 30s the last two days, but it feels warm during the day because of the strong high-altitude sunshine. Two weeks ago, I saw a Robin in our neighborhood. Don’t know where he came from, because we’ve had some below zero weather. Merry Christmas resonances and joyous new year frequencies, in this grand new journey about our beautiful electric variable star! “And so this is Christmas, and what have you done? period of 64 years, most recent peak in 2005, and most recent dip in 1973. This pattern managed to sustain from 1879 to 2005. Furthermore: When reducing 1973-2005 “smoothed global warming” according to UEA version of HadCRUT3 by .217 degree, what is the warming rate – and how much positive feedback upon CO2 change is required to make that true? prior to 2005 but not in the future from 2005. With such considerations, it appears to me that “global climate sensitivity” to change in CO2 is about 1.1-1.2 degree C/K per change by a factor of 2. The feedbacks added by nature appear to me no more thyan slighjtly positive, maybe slightly negative. Furthermore, it appears to me that as global warming due to increase of greenhouse gases progresses, the most-negative feedback (the lapse rate one) has its magnitude increasing. I will try to keep updating it. It is a bit eclectic…kinda like Watt’s Up With That! Christmas is a marketing gimmick and you are all suckers. The religious elements are a fiction. Look it up. It is a pagan winter festival not a christian event. It’s not in the Scriptures. It was invented as a political device to assimilate pagans into the Roman church. Merry Christmas to Anthony and the WUWT mods and bods! I bet you’re lots of fun at a party. “Watts Up” is really “down to Earth”. Thanks for the sanity amid the lunacy. Wishing you many more great years to come ! To all the moderators who make this blog work. Have a relaxing and fun Christmas and new years holidays. Moderating a busy board like this is a huge amount of work and you all do a bang up job. Many happy wishes to you and your family and friends. Merry Christmas from a knuckle-dragging, redneck, Neanderthal, Luddite, d-word flat-earther …..
It’s kinda cool being a better scientist than them. (….. and knowing that the time will come when they have to both admit, and deal with the above). Merry Christmas from Washington State east of the Cascade Crest! Merry Christmas and Happy New Year to Anthony, the Mods, and everyone. Reply: A map of the world to scale would be about 40,000 km wide. I think what you are looking for is information on different types of map projections, ~ctm or the representation of spherical geographic information on flat surfaces. The celebration of Jesus Christ’s birth. Have a very Merry Christmas all! May the blessings of liberty be yours for all time. You’ve done the world a tremendous service and wherever you are, best wishes go out to you. Stay safe. Copyright can be a problem. If you very briefly post on an early thread on web site by my name I’ll pick it up. I don’t think Eric goes to parties – those are marketing gimmicks by big business. Further, Eric doesn’t believe in fictions. However, the country in which I live does have Christians and they celebrate Christmas as the birth of Christ, despite knowing the date of birth is unknown. Yet this “fiction” drives major sectors of the world’s economy and encourages goodwill, cheer, and hope. In this way the idea of a “pagan winter festival” morphs into a world wide festival regardless of whether it is summer, winter, or whatever — location-wise. Eric will now list or calculate everything he has obtained in this life based on fictions and make proper amends. Friends here got together for a joyful Solstice—food, music, singing – and will repeat on Christmas Day. Thus, I and others are called suckers! Well, we will live with (and also cheer) that. Does anyone have URL of a map of the world to scale? If you read some on the “home site” page you will find that the thing you want is very difficult to provide. And it succeeded pretty well, didn’t it Eric? Yes, Yuletide was originally the winter solstice holiday. Lots of ale (I mean LOTS of ale) was downed. Toasts were made to the gods, the goddesses, the king, and finally to the memory of the departed. Lots of food was then eaten, along with drinking more ale (LOTS of ale). It was a time of mirth and joy. Trees were often cut down, brought in to houses, and decorated (Jeremiah 10:1-5), though that was done long before the Christian era, and the Christians were not told to avoid Christmas trees, just the Jews. And yes, Eric, the religious elements are a fiction. Obviously Jesus was born in the springtime, when the lambs are born (some symbolism in that). But if people choose to commemorate someone’s birth at a different time of year, and do it with a spirit of goodwill and cheer, I certainly think it is appropriate. All you have to do, Eric, is ignore all the good wishes and gentle humor, and sit in your corner and sneer at the rest of us. And definitely you should avoid the ale. Happy Christmas, Merry Hanukkah, and an ale-filled winter solstice to all! Everyone will have a merry Christmas! Data for New Year is in review. From a friend over the big pond that might give some cheer…. When four of Santa’s elves got sick, the trainee elves did not produce toys as fast as the regular ones, and Santa began to feel the Pre-Christmas pressure. Then Mrs. Claus told Santa her Mother was coming to visit, which stressed him even more. When Santa went to harness the reindeer, he found that three of them were about to give birth. Two others had jumped the fence and were out. Heaven knows where! When Santa began to load the sleigh, one of the floorboards cracked, the toy bag fell to the ground and the toys scattered. Frustrated, Santa went in the house for a big shot of rum. When he went to the cupboard, he discovered the elves had drunk all the liquor. Now you can finally relate to Santa… even he has those kind of days! WUWT is the gift that gives all year long. Thanks to everyone for their stimulating contributions over the year, and of course to Anthony for having such a great place to exchange ideas. Merry Christmas & Happy Holidays everyone! Enjoy your time off Anthony, and thanks for all you have accomplished this year with the support of a great moderator team. Merry Christmas and Happy New Year. Lucy, you left out Texan: Merry Christmas, y’all! A gorgeous White Christmas in West Texas. Many thanks to Anthony and the mods for all their hard work, and more thanks to the learned commenters. I learn more all the time here, and am looking forward to future education. Best Wishes to all, wherever in the world you are, whatever your AGW leanings, political, or religious. Merry Christmas to Anthony and his family and to all of you who do the research, write the postings and contribute via comments on Watts Up With That. I read your work every day and deeply appreciate all of you. Merry Christmas everyone. The day is nearly over here in southern NZ. Its been warm, still and very pleasant. Please spare a thought for the people of Christchurch who, after all the earthquakes of the past year or so spent the day before Christmas Eve enduring a sequence of jolts, several over 5 and one at 6 on the Richter Scale. Thanks Anthony, mods and all who contribute. Happy new year. You will find descriptions of quite a few equi-areal map projections on this page. http://en.wikipedia.org/wiki/Map_projection#Equal-area Follow the links to see the various maps, pick the one you prefer for your purposes and then google that projection. Merry Christmas and Happy Hanukkah everyone and happy whatever winter solstice celebration you choose! A Merry Christmas to Anthony and Moderators, and all who contribute here. The best wishes for a prosperous and healthy new year to all. By the way, the Hadcrut3 November numbers just came out and 2011 slipped from 11th warmest to 12th warmest on that set. 2011 is also 12th warmest on RSS. This forum has taught me I much over the last few years. I usually visit here multiple times per day to enjoy the open discussions that should define all true seekers of truth, knowledge and wisdom behave. Initially, I was only slightly skeptical regarding Global Warming. However, the more I read, the more increasingly skeptical I became that CO2 was great evil that “the Team” made it out to be. I tried reading the pro-CAWG blogs also, but was put off by their one-sided “discussions” and egotistical views regarding all whom presumed to disagree with their rigid mindset. It has been a joy and a blessing to listen to the discussions here. A very Merry Christmas and all the best for the New Year. Just nabbing a quick breakfast cuppa before I begin preparing the Christmas lunch (roast sirloin and Yorkshire pud). All the very best of the season, everyone. There is noway that I can let you all know that I wish you all to have a really wonderful peaceful Christmas and try to show some originality in my comment, so I’ll just throw up a lantern and wish you all the very best, have a Merry Christmas and be safe. Myrrh says “Does anyone have URL of a map of the world to scale?” – but what projection/ scale do you need? In case it helps I have a ~16k point simple lat/long world coastline map (I forget exactly where it came from …!) which I tend to use for world projections – see the Tinypic link below for a rather poor quality screenshot of an Excel spreadsheet on my machine with this data, which gives a dynamic sub-solar view of the earth in real time, just as a bit of fun! Happy to let you have a copy of this spreadsheet (on a supplied as seen, no warranty basis!) if you can let me have somewhere to post/send it to. And here’s wishing a merry and peaceful Christmas to all – especially Anthony and the Mods (isn’t that the name of some pop group?) for hosting this excellent site. 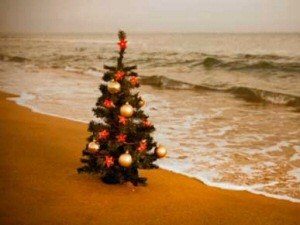 Warmest best wishes for a happy Christmas and less conflicted 2012. May the evidence and tenacity of real science reveal the intellectual bankruptcy of the politics of consensus. May those who have led us down this path be remembered forever and held to account. Have a rockin’ Christmas everyone! We know that, Eric, and we don’t care. Merry Christmas to you anyway, and to all at this site. Merry Christmas from a wind blown Falkirk. Thanks to everyone at WUWT. Merry Christmas to Anthony, the Mods, and all the contributors from a mild and slightly damp West Sussex. Looking forward to Christmas day with the grandchildren, and hoping that 2012 will bring more progress towards removal of the CAGW millstone from all our grandchildren’s futures. We clearly have the better Team here! Merry Christmas everyone! Even Eric! Merry Christmas everyone and a prosperous New year. Well Christmas day is almost over in Melbourne, Australia We had 4 seasons in one day today, needing the beach at lunchtime and finally cooling down with hours of thunderstorms, torrential rain, huge hail and even a tornado!! To Anthony, the mods and the wonderful contributors all, THANK YOU for providing me with sanity, fun and education! Merry Christmas/Solstice, whatever, and a Happy New Year! Annie, (currently enjoying Christmas in the Arabian Gulf). ‘Cold Moutain’ (Han Shan) reached Cold Mountain (120° 48.9′ E 29° 4.6 ‘ N) in the cold year 760. Summer the ice doesn’t melt. He wrote poems on the rocks. A first blogger. or greeting a guest talking Zen. and we finally see who we are. Cold Moutain (Han Shan) reached Cold Mountain (120° 48.9′ E 29° 4.6 ‘ N) in the year 760 AD. A stalagmite from the Spannagel cave in the Alps confirms there were cold times, but also the Suns partner. Thanks for the ‘rocks’, Anthony, we can write words on. Merry Christmas to Anthony, the Mods, and all the contributors and readers from a snowy spa in Finland. On vacation here this Christmas season with family. Can’t resist visiting WUWT on a daily basis. Wondering if FOIA is going to end up in the history books as famous as Paul Revere. And from deepest Borneo …. where I can assure anyone worried about an extra 2 degrees of warmth not to be …. also wishing you a very merry Xmas. You do a great job …. don’t stop …. in the end the truth is the truth !! Merry Christmas and all best wishes for the New Year to Anthony and all fellow climate realists. Lets hope that some further light will be shone upon this issue next year, and that sanity will at long last prevail and the politicians will pull back from destroying western economies and condemning all those in developing countries to a life of hradship and poverty without the benefits of cheap and plentiful energy. Thanks for everything, Anthony, and a Happy Christmas to everyone. Here is a list of Christmas presents I have sent. No moderators! Gone till Monday!…. wooooo HOOOOO!!! ….pitter patter pitter patter… (*runs to one side of the website — knocking fonts over*) …trample, rumble, *BANG! *… (*jumps off of banner diving into the sea where a Christmas tree grows inexplicably on the sea shore — OBVIOUSLY a sign from Gaia warning mankind against it’s follies, kicks over social media thumbnails on his way out*) …”yeah!… occupy WUWT!” … ~-~♪ ♫ ♩ ♬ …(*blast of horn//penny whistle blares! *)… `~-♪ ♫ ♩ ♬ ♭ ♮ ♯ ° Tooot — Toooot!. Merry Christmas and Happy New year everyone. And a special thanks to Lance who posted very early–Thanks for your service and your son’s. I have been the family waiting at home, too. “They also serve who only stand and wait.” I pray every day for the safe return of service men and women overseas and away from their families. Merry Christmas to you and yours Anthony! A very Merry Christmas and God Bless you all. ….from Colorado Springs, where we’re both tracking Santa (NORAD) and enjoying a white Christmas. A very Happy Christmas to you and yours, Anthony! The same to all you mods – I hope you’re well provided with mince pies and gluhwein. And the same to all you posters! Eat, drink and be merry, because we’ll all die: either because it is too hot, or because it’s too cold, or too wet, too dry, or too stormy, as it is in good old Blighty right now. It is of course our own fault, no matter what (and the watermelons will ,of course, never die of anything ..) – so we might as well have a good time! Merry Christmas and Happy New Year to All. From Northern Minnesota. Just to round out the Season’s Greetings, and to slip further down the imaginary axis . . .
And we all could share our mirth. Oh lights. Oh lights divine! From our friends at the CPA, a Christmas message and a lesson in climatology and geology, could have been spoken by Bob Brown and his lackeys in the Labor Party. Buon Natale e tanti auguri a tutti voi per l’anno nuovo. Best to all, and : Merry Christmas, Happy New Year to all men of good faith. Merry Christmas and Happy Holidays (whichever you celebrate) to all. I am simply glad that sunset today here on the sunny, warm west central coast of Florida is 17:42, tomorrow it is 17:43 and the next day 17:44. Spring is on the way! Celebrating today with a nice cookout (barbie for those down under) at the beach. 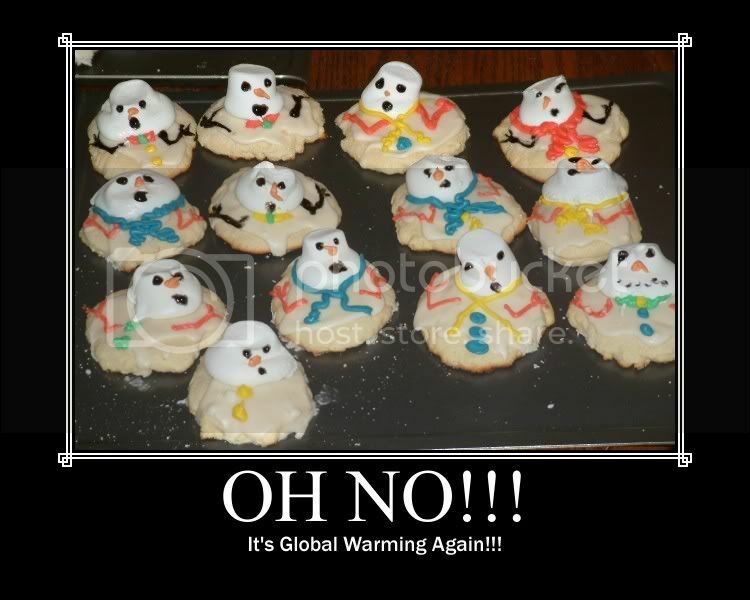 Thank goodness for global warming!!!!!!!!!! Linksmų Kalėdų ir laimingų Naujų Metų! Hello. I have a question that someone may be able answer. a small range of hills and then a 15×15 km hinterland. possible to produce a daily mean for each station. means for the 3 ‘urban’ and one ‘rural’ station are 10.5, 10.5, 10.5, 9.5.
conclude that there has been a decrease of 0.25 deg per hectare? Merry Christmas and sincere appreciation to Anthony and the moderators for their incomparable work, and my warmest Christmas wishes to Smokey, our indefatigueable troll-slayer (whom I would also like to thank for making me aware of Maggie’s Farm some time ago). So, could it be that Prof. Mann had been working on a graph of his improved grant money results and he just used that data for the hockey stick graph itself. The gasp of “He Came! !” from the rug rats this morning said it all!! And a special thanks to Anthony & the Mods!! U don’t suppose the Mayan calender was predicting the fall of global warming hysterics do u? If so, hear hear to its ignoble demise. Oh, if only there were a simple answer to that! What they do is divide the world into “grid cells”. The grid cells range in size based on which version of which temperature record you are looking at. The grid cells are defined by latitude and longitude. Most common are 1×1 degrees, 2×2 degrees and 5×5 degrees. That of course means that the area of a grid cell close to the poles is smaller than that of a grid cell at the equator. Then you have the matter of what area the weather station is presumed to be valid for. GISS for example gives their results based on both 250 km and 1200 km radius. Here’s a link where you can look at their data graphicaly based on either one. If you compare the 250 km radius to the 1200 km radius, you’ll see that there’s a lot more blank cells in the former because they don’t have enough valid data to assign a temperature to that grid cell. How they average over lapping weather stations is beyond me. From snow-coated (maybe 2″) southern New Brunswick, where it got down to an unseasonable minus 18°C (0°F) overnight, I send best wishes for the solstice season (and whatever else you care to make of it) and best wishes for the new year. WUWT has provided a continuing stream of factual information to overcome the misinformation of the warmists. I want to thank Anthony and the patient moderators for making this all possible. Santa her Mother was coming to visit, which stressed Santa even more. wait until December 24 to decide if he would be able to pull the sleigh. off the end of the broom. Merry Christmas to you, Anthony and Moderators, from Virginia! Not a white Christmas this year, but there is a delicious bite to the air. I hope you all are enjoying your holiday as much as we are enjoying ours. Happy Christmas and New Year Anthony and all who contribute. Win lose or draw, the world is a better place for WUWT keeping the debate open. Harder to think of a better compliment than that, that the world is a better place for you being in it. Merry Christmas Anthony and mods. Best wishes to you and yours. Thanks you for all you do. Best of seasons to Anthony, the Mods, contributors and lurkers to one of my favourte sites! You’re doing a lot for science and for proper scientific practices, a beacon for truth and free speech, thank you. I feel 2012 will be an interesting times for science and one hell of a year for political fall out! Great story about Silent Night from the Second World Warm…seems timely. I think I have all the Christmas Songs from this post on a WUWT Christmas playlist. Lets get ‘Shaun the sheep’ a few more ‘Like’s’! Merry Christmas everyone . . . this cyberplace of Anthony’s feels like home . . . and there is no place like home . . .
P.S. – on this day of family and friends I do not forget those Wise Men who we call the moderators . . . cheers to you all . . . Happy holidays to all that make this forum possible. Never gonna make you cry, Never gonna say goodbye, Never gonna tell a lie and hurt you” – Rick Astley. Watt’s Up With That has been Rick Rolled! Merry Christmas Anthony, moderators, commentors and trolls. May your day be merry, your families happy, your roads clear, and your fences strong. From the North American steppe, where six inches of unforecast global warming has given the southern plains a whiter Christmas than in New England! Thank you and best wishes for the holiday season and to all those associated with WUWT who have made it such an outstanding success for freedom of thought and expression of ideas for the underdog. May it go from strength to strength in 2012. Just as Susan Boyle gained inspiration from Les Misérables and dreamed a dream for suppressed talent, let us keep dreaming that there will be a life to start when tomorrow comes and a world we all long to see. >> for. GISS for example gives their results based on both 250 km and 1200 km radius. and that this contributes to the overall mean on that area basis ? cover 5km away, let alone 250. This aspect needs to be investigated further, I feel. Yes, Maggie’s Farm is an excellent site that often links to WUWT articles. That’s why I’m happy to link back to them. Every day they have links to interesting sites. For example, scroll down to “Saturday morning links”, “Friday morning links”, etc. Merry Christmas to all. Craciun fericit. It’s the busiest time of the year for a mother to prepare and share a wonderful Christmas dinner with one husband, and 4 hulking sons and their friends.But at my first chance today to put my feet up, my first choice is to visit WUWT. What a treat to end the day reading the wonderful greetings from around the world here. Best wishes to all for a wonderful Christmas and happy holiday, and again, thank-you to Anthony, writers, those who share comments, and our patient and witty moderators for their wonderful efforts. I cannot better what davidmhoffer said above: Anthony has created a forum here “that is a major part of pulling the human race back from a descent into insanity”. Yup! They do! I’m not certain which one they use for the offcial temperature record, but I think it is the 1200 km one which is even more ridiculous. Then, if they have a weather station whose radius extends into the ocean, they use the land weather station data instead of the ocean surface temperature within that radius. 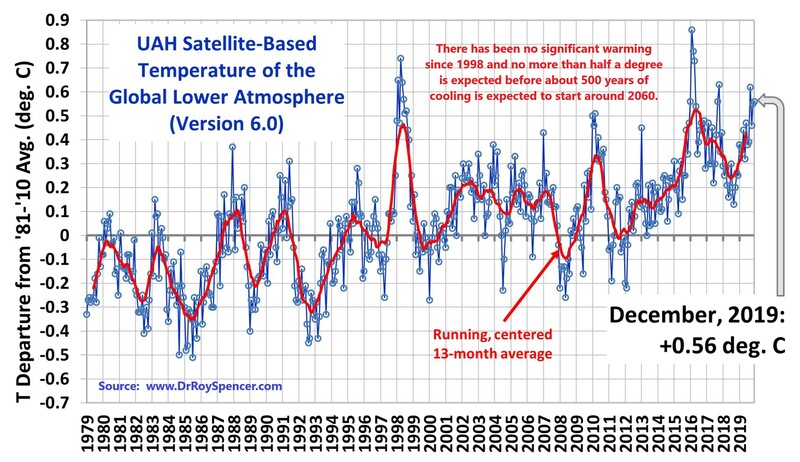 Steven Mosher is the guy who is really deep on this stuff, but the problems with the reliability of GISS and how they assign temperature just go on and on and on and…. So, the “standard” is 1200 km…. Merry Christmas and a Cooler New Year everyone! That curved trend line must be becoming more of an embarrassment for Spencer each month. David and Rex: I understand the breakdown of thermal energy stored is close to ..
Leaving aside the atmosphere, I suggest temperatures above ocean surfaces should be weighted 90:6 compared with land and other ice. This means a weighting of only 6/96 (that is 6.25%) for land surfaces would be more appropriate than anything near 30%. This would reflect the far greater stabilising effect of the oceans. Our best guide is thus NASA sea surface data which (unfortunately?) failed October 4, 2011. 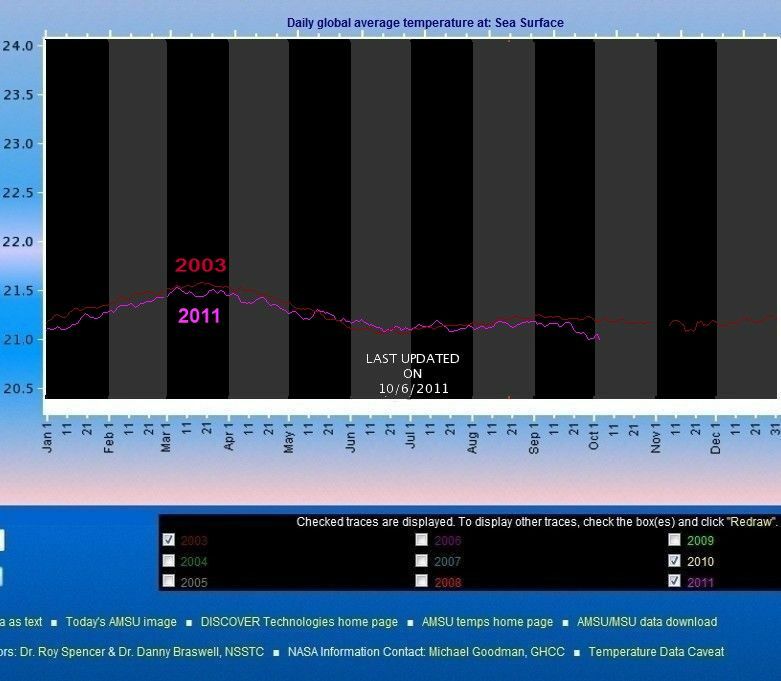 But at least up to that date it showed 2011 being cooler than 2003 http://earth-climate.com/2003-2011.jpg . Rex, many people misunderstand how this works mathematically and why it works as well as it does. Now, consider a place y, 1000km away. Lets assume that its 10C. How can Giss or anybody else use Just one of those locations? Why look, the temperature changes every few km? it makes no sense.. right? Not so fast. Lets look at the station at place x. Over the course of 30 years it goes up and down. decade, what do you suppose happens at place y? 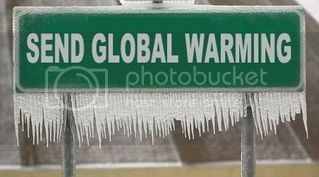 Well, it also goes up by .2C decade. northern most latitudes 1200km is a good cut off. One way we test this is by starting with thousands of stations and removing stations. remove 8000. trend doesnt change, remove 9500. trend doesnt change. Why? because the field is spatially coherent. by with very few stations. Merry Christmas to all, even though it is past midnight on the east coast, and the holiday is officially “over.” However it is not over to the West, and, in a sense, it is not over anywhere, ever. Even if the entire human race chooses to become ignorant, Truth remains true. It is a light which darkness cannot quench. There is no such thing as a flashlight which can produce a ray of darkness, but a single candle can defeat the darkness of a vast cave. In my youth I was always on the lookout for some sort of Christmas miracle, some proof light was more powerful than darkness, and I usually could find one, because I took the time to look. We are in fact surrounded by “signs” of the power of Truth, though we may be blinded by discouragement and fail to see them. Rent was due, and I was five dollars short. I lived in a motel unit, in a rough part of a rough town, and the owner of the motel was from India and could care less if it was Christmas Eve. He had a reputation for putting an odd clam-shell thing on your doorknob if you were late with your rent, and it kept you from opening your own door, until you came up with the rent. But I figured if I flourished fifty-five dollars in his face, he might let me stay in my unit on Christmas Eve, though the rent for the motel unit was sixty. However when I peeked through the picture window into the front office, I had my doubts. He had a mean look that evening. Not Christmassy at all. I figured I’d likely be sleeping in my car that night. I don’t blame you if you don’t believe me. To be scientific you’d have to replicate the event, but I don’t expect I’ll ever see that sort of coincidence ever happen again, in my life. Only now are we becoming aware there were some who don’t like the light of Truth, and who were spending vast amounts of money to keep the public in the dark. However they failed to include the internet into their calculations. We have all witnessed, and indeed been part of, a miracle. Despite the best efforts of those enamored of darkness, Light always finds a chink, and shines through. Remember that, and keep the faith, should times grow dark, this coming year. In a groveling display of special pleading, climate scientists studying a developing tropical cyclone east of Darwin have named it “Grant” and have written it up before it is finished. However, instead of growing through class 3, to 4, to the top rank of 5, it has now been degraded to a “low”. Those who have tickets on themselves about understanding tropical cyclones, their conditions of formation and the controls on their paths, should study this cyclone to be humiliated. Two turns of 180 degrees in a day or so. In Africa they say “Mumbo jumbo”. Here we say “sit down talk”. You have to realize that the toolbox of statistical weapons available for the modern researcher to perform their various assaults on the sundry data sets that come under their consideration is an amazing thing. Despite this fact, or maybe because of it, I have over my years visiting this site, whenever I’ve been confronted by a lengthy deposition on how it is possible to extract incredibly precise results from data that is scant and shoddy, found that a catchy little tune from the days of my youth will almost inevitably pop into my head after just a few paragraphs. Being as you are from NZ and I have no idea of your age I suspect you probably may have no idea who Arlo Guthrie is, but he had a small hit back in the Sixties with a song titled “Alice’s Restaurant” which starts out “You can get anything you want at Alice’s Restaurant”. Check at about 0:45 on the clip and unfortunately not again until about 16:30. As I understand it, the main thrust of the piece is that climate scientists would like to blame all the weird weather of the last year on humanity, but they just can’t because the cheapskate politicians refuse to give them enough money. Merry Bloody Xmas to all Climate Realists!! A Happy New Year to all people who believe in this website and Lord Monckton! A big fat rasberry to prophets of doom…..
Keep up the good fight Wattsy and the Lord and all other contributors. Australia needs this site more than ever after our Carbon Tax Crap! Bring on 2012, It`s gonna be a hell of a ride!! Hey, Phil??? Many thanks to all who’ve responded to my request – it’s been quite an education, I hadn’t realised it was so complex. I now know what I wanted was an atlas showing countries and borders in ‘equal area’, because the distortion of Greenland being so much bigger than India made for a very strange look at the world, and that picture is ubiquitous. This does come close.. Is it possible to improve on it? Great allegory for the ‘system’. It’s a shame when your 5X7 glossies aren’t what you think they are. I remember when if a photo was printed at 5X7inches, it must represent something of import. A view from the Group ‘W’ bench. “One way we test this is by starting with thousands of stations and removing stations. The trend on an airfield in Brazil is the same as on the mountains in Bolivia. That’s why you don’t need thermometers in Bolivia. Once more the BBC threatens us with doom. A programme called “Our World – The Vanishing Antarctica” was aired today. It’s available on iPlayer to those who can access it. Did you know the IPCC have come up with a scheme to export tinned CO2 to the moon. It will be injected under pressure into cans of liquid. Two companies have been awarded the lucrative project which will be payed for by government taxes. Cabon Dioxde Kept Encapsulated (COKE) and Permanently Encapsulated Prohibited Substance (PEPSI). The Wikipedia ref below has quite a good article on projections including the Eckert IV and VI “equal area” projections – which are still subject to some shape distortion, by the way. Practically it’s simply not possible to render the surface of a sphere accurately onto a plane without either discontinuities (tearing) or other compromises (unusual or unequal scaling of meridians and parallels). Really it’s down to personal preference and your required use for the particular projection. The gnomonic is the most fun, over the poles! Ah, the wonders of modern technology! A word of caution, use wisely, or one may find one self unemployed or divorced very quickly indeed, for some people in senior management have absolutely no sense of humor!